What is Tapu Lele's shell supposed to look like? Each of the four Alolan Guardians has a distinct design when their shell is closed. But what on earth is Tapu Lele supposed to look like when its shell is closed? At first I though it was a nautilus shell, but upon closer investigation it doesn't appear to be so. Are there any ideas as to what Tapu Lele is supposed to resemble? Bulbapedia seems to think that it's based off of a butterfly, but I'm not so convinced. EDIT: The Sun/Moon page says it uses healing scales, and butterflies wings are composed of scales, but still. The black being the actual body itself and the red is me adding other features to make you see the resemblance (which was probably completely unnecessary but you know it's on the internet forever now so). Furthermore, Bulbapedia says that 'lele' originates from the word 'pulelehua', Hawaiian for butterfly. 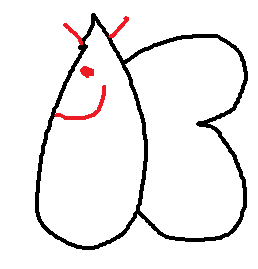 So yeah, probs a butterfly. I'm waiting to get proven wrong though. Source: Above comment (lol thnx) and Leonardo da Vinci. answered Oct 28, 2016 by !'•-Indigo-•'! Btw I drew that picture to paint and I copied the picture and went to imgur and pressed Ctrl + V and the picture uploaded IMMEDIATELY! There's no reason to not love imgur. commented Oct 28, 2016 by !'•-Indigo-•'! Also when it's in its shell, its two long front bits of hair stick out of a gap at the front (you can see this in the japanese version of the latest trailer when they're using their unique z-move) so that they look like a butterfly's mouth. 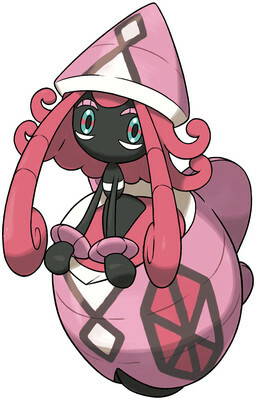 Tapu Lele is supposed to resemble a butterfly. The longest parts of its "hair" become the antenna, the hexagonal designs on its shell are the eyes, the black piece on the bottom becomes the proboscis, and the protrusions on the backside of the shell are meant to represent the wings. I think it's supposed to be a butterfly about to get out of its cocoon. IVs of the Tapus once caught? Tapu Fini Or Tapu Lele? What is a good moveset for Tapu Fini? What is a good moveset for Tapu Lele? What is a good moveset for Tapu Bulu? Why does Tapu Fini outspeed Tapu Bulu?